Dr. DeBias and the professional staff at The Institute have performed over 700 procedures utilizing the innovative Venus Viva rf microneedling device. They have helped thousands of patients offset the effects of aging, while promoting better skin health utilizing radio frequency skin tightening techniques and other state-of-the-art technologies. Venus Viva is a radio frequency microneedling device that is used primarily for facial and neck skin tightening. It is designed to improve the 3 T’s of your face and neck skin – texture, tone, and tightness. Venus Viva enhances the overall quality of the skin by combining Nano-Fractional Radio Frequency™ (RF) and the SmartScan™ technology to penetrate the skin deeper and treat multiple areas in the same session. This procedure stimulates the production of collagen resulting in firmer and thicker skin. Venus Viva™ is one of the only minimally invasive RF systems that allows your physician to customize the intensity of the treatment to your needs and your personal preferences. With this revolutionary technology, the Venus Viva skin rejuvenation procedure offers dramatic, long-lasting results in just one 10-minute treatment. A series of treatments is recommended to achieve your best skin health. Further treatments will continue to maintain optimal skin health. How much does Venus Viva cost? Our introductory special is $395. Are Venus Viva treatments safe? YES! Radio Frequency has been used in medicine for many years and is a proven, safe, and effective technology. Dr. DeBias has been using radio frequency devices safely for over 10 years in his aesthetic practice. He will review your medical history and your aesthetic goals to see if the Venus Viva treatment is right for you. It is well tolerated by patients and there is minimal downtime required – Just one day of redness occurring after the treatment. Learn about Venus Freeze, Exilis Ultra, and Pellevé for no downtime skin tightening. How long do the effects of Venus Viva last? Based on data collected by Dr. DeBias, one treatment can give results which take multiple years of aging to offset. How many Venus Viva treatments will I need to see results? 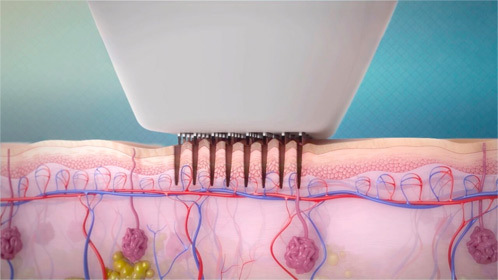 One treatment will provide significant improvement but multiple treatments will give even more dramatic results. Can Venus Viva treat acne scars? Yes, microneedling reduces scar appearance and improves texture of the skin. For more dramatic results learn about Active FXTM. Also, INFINI is another rf microneedling procedure, similar to Venus Viva, which targets deeper layers of skin and helps reduce the appearance of acne scars. Want to compare your skin tightening options? Sign up today to receive special offers and our newsletter via email! "Depth of knowledge, best technology, most experience, and artistic talent ensure optimal patient results and outcomes." Copyright © 2019 | The Institute for Laser & Aesthetic Medicine. All rights reserved.